If I were to pick a tough, all-classic-looks, a true hair clipper for men…that would be the Oster Classic 76 from Amazon.com. Once you hold it in your hand, you’ll know how a genuine barber clipper feels. The 76 is all about quality cuts, professionalism and vintage looks in line with American barber traditions. It’s powerful, sturdy and yes – loud. Its noisy nature, however, is akin to a Harley-Davidson. In other words, pure class. Let me introduce you my favorite hair clipper in this Oster Classic 76 review. In this Oster classic 76 review, you will find that this Oster barber clipper is not your typical boys’ tool. Weighing around 1.7 pounds, with a bigger-than-average body just above 7“, it’s destined for real men. You’ll need a solid grip to hold this tough fellow for longer periods of time. In return, it’ll give you high class cutting action. Oster Classic 76 clippers are up there with Andis Master in terms of durability. If not, they are even tougher than the Andis barber cutter. The 76 body is made of valox material that is fall-resistant and pretty much unbreakable. You won’t have to worry about the Oster 76 housing at all. The clipper’s design is amazing. No other brand can achieve such vintage looks, distilled in how old-school barber tools looked like. You’re getting a living legend with the 76, no doubt about that, and more that you will find out in this Oster classic 76 review. As a corded hair cutter, this Oster professional clipper comes with a durable, thick 9 foot cord. That’s 1 foot than your usual cord length, so you’ve got some bonus flexibility. You’ll also receive blade oil, clipper grease, a cleaning brush and instructions. The 76 is Oster’s most famous clipper and the brand’s poster boy. Thus, all Oster 76 parts in this Oster classic 76 review are of extreme quality. First things first, the motor. This model comes with Oster’s most powerful yet, a single speed universal motor. Blowing standard pivot or electromagnetic motors away, it makes the 76 a real king among professional heavy-duty hair clippers. High volumes of hair and continuous use are nothing to the roaring engine beneath the valox. As for the Oster 76 clipper blades, they are made of stainless steel and tested in extremely harsh environments to ensure both durability and sharpness. This barber hair cutter is a detachable hair clipper. In other words, you have to change the blades – compared to adjustable clippers. 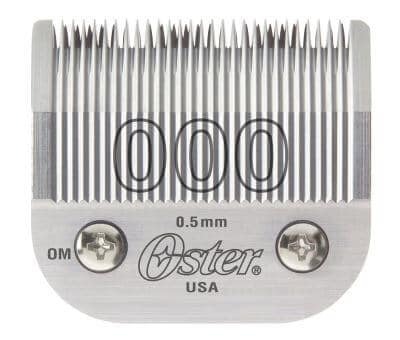 Upon buying the clipper, you’ll get Oster blades size 1 and 000 with it. The #000 blade leaves hair at 1/50″ (0.5mm) and is perfect for clipper over combs and really close fades. The #1 gets you a 3/32″ length (2.4mm) and is perfect for bulk removal and medium fades. While challenging at first, clipper maintenance with the Classic 76 will grow on you eventually. I want to especially emphasize on the importance of oiling your blades. As a professional tool, this Oster model will last you extremely long. However, you need to take care of it, more so than your home use clippers. Let me get this straight: this is a heavy-duty, professional Oster hair clipper. If you’re looking for compact, light solutions, look elsewhere. Remington HC4250 shortcut would be a fine choice. The Oster Classic 76 gets hot and noisy. With such a powerful motor and a bulky body, you can’t help it. In fact, it might be one of the noisiest barber clippers, so you should be aware of that. This is what you trade for having a no-compromise hair cutter for barbers. As I said, this is a hair clipper for men, not a boy’s tool. In case your Oster 76 blades run too hot, you should use a coolant. Always be prepared to take a break after a lengthier haircut. Barber tools are like this, the Andis Master itself overheats easily too. Expect the 76 to start getting warm around the 15 minute mark and act accordingly. 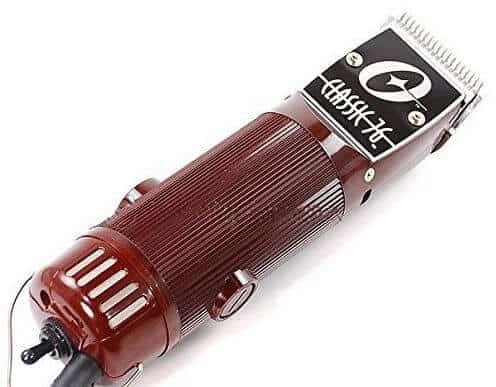 When it comes to noise, I already mentioned it: this is the Harley-Davidson of hair clippers. It roars, instead of humming. It’s loud. But it’s tough, manly, and will make you feel proud. Oster have thought of people with different preferences when it comes to their clipper of choice. The Oster 76 comes in three limited editions: deep blue, pink as the perfect hair clipper for women, and the exquisite woodgrain color. 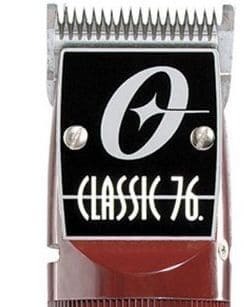 Without any doubt, Oster Classic 76 clippers are a fierce, powerful, overall amazing barber tool. They are all muscle, durability and professionalism. If you’re looking for a heavy-duty, quality-cuts tools, your search ends here. If you want a mix of barber tools and more casual use, you can try out the Oster Fast Feed. It doesn’t get that hot, has a lighter body and its pivot motor will net you great haircuts – from fades to buzz cuts. Grab one of these, feel manly, enjoy the motor noise and remember to oil and cool them. You won’t need anything else.